It’s that time of year again… Sparkling holiday window displays, lit up wreaths & beautifully decorated Christmas trees, holiday markets, snowfall & glittering snowflakes and (hopefully) the feeling of joy & good cheer. 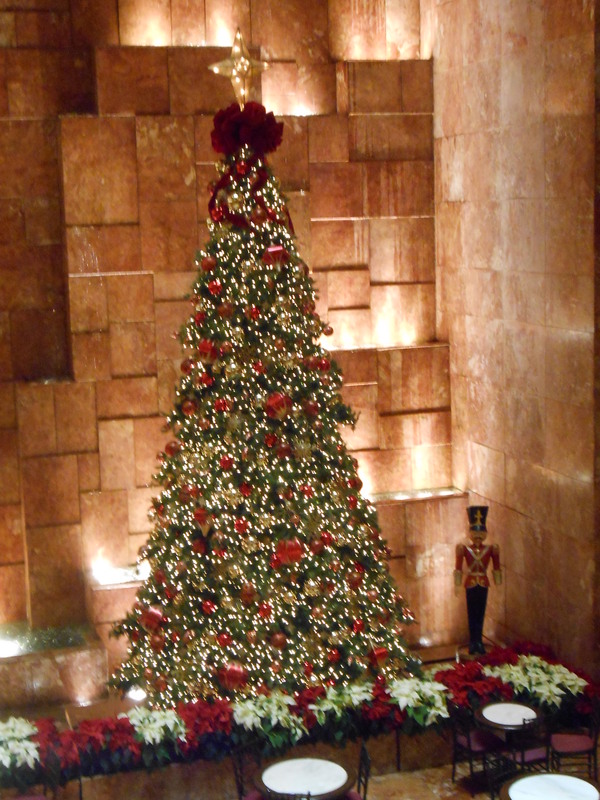 Some friends and I did a holiday walking tour along 5th Avenue, where we hit up classics such as Bergdorf Goodman, Columbus Circle, gorgeous hotels, Rockefeller Center and more. 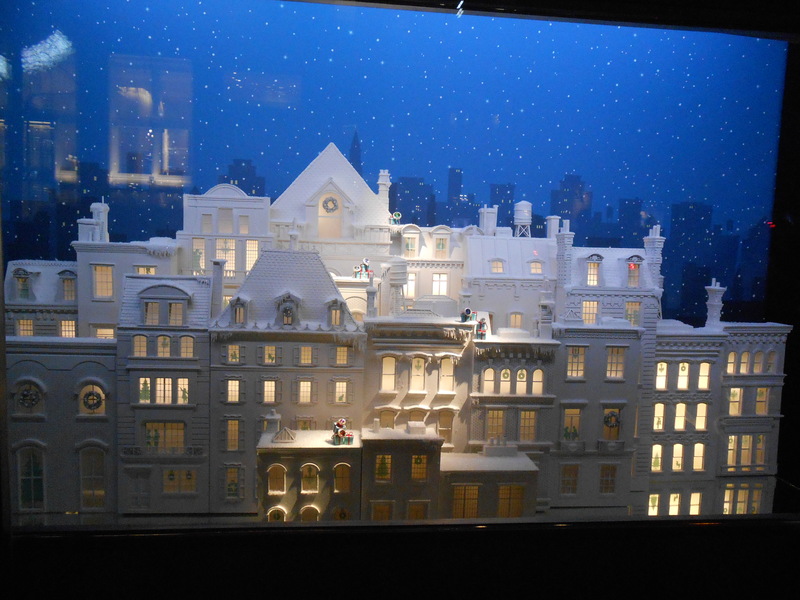 Of course I sighed at the sight of Tiffany & Co, their windows showcasing mini apartments against velvety-blue city skyline dotted with lit windows, sprinkled with brilliant rings and other pieces of jewelry. 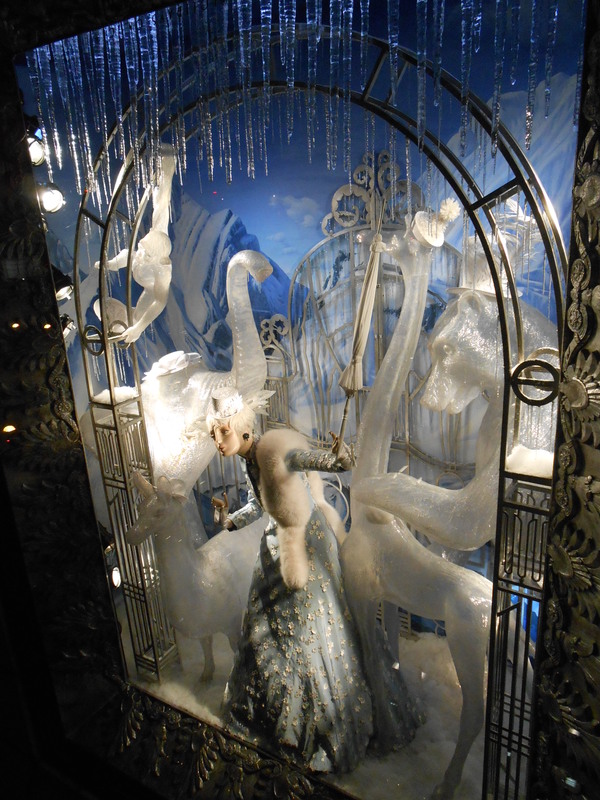 I loved Bergdorf Goodman: Truly lovely, intricate designs and couture gowns. The first display was of a shiny white tree with icicles hanging from the ceiling. The next display, a patriotic affair of red, white, blue, complete with soldiers and a white horse. 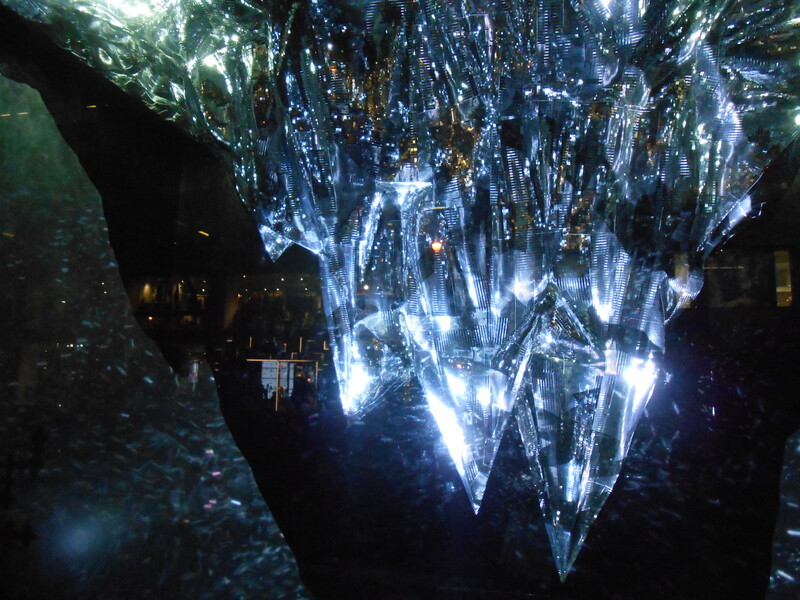 Third display showed a blue mountainous background with ice sculptures of a bear and other animals. 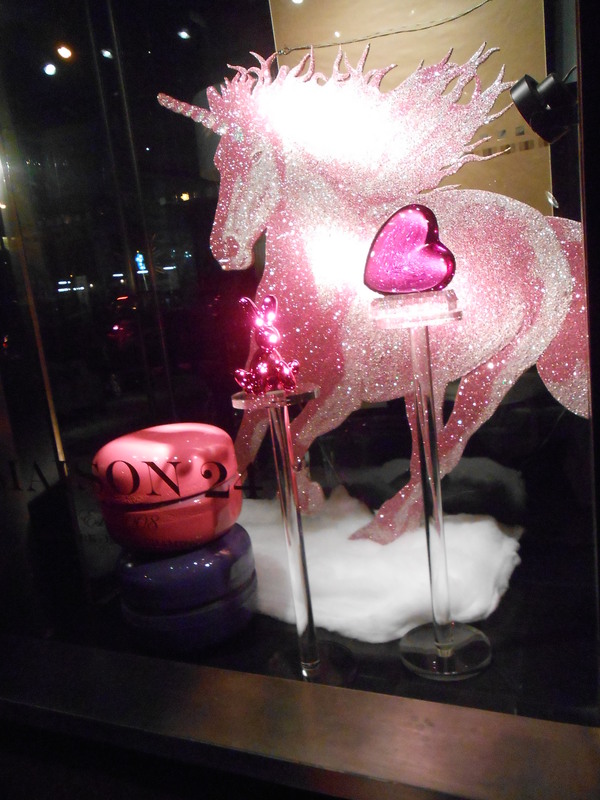 The last was everything pink, girly with a crystal chandelier. 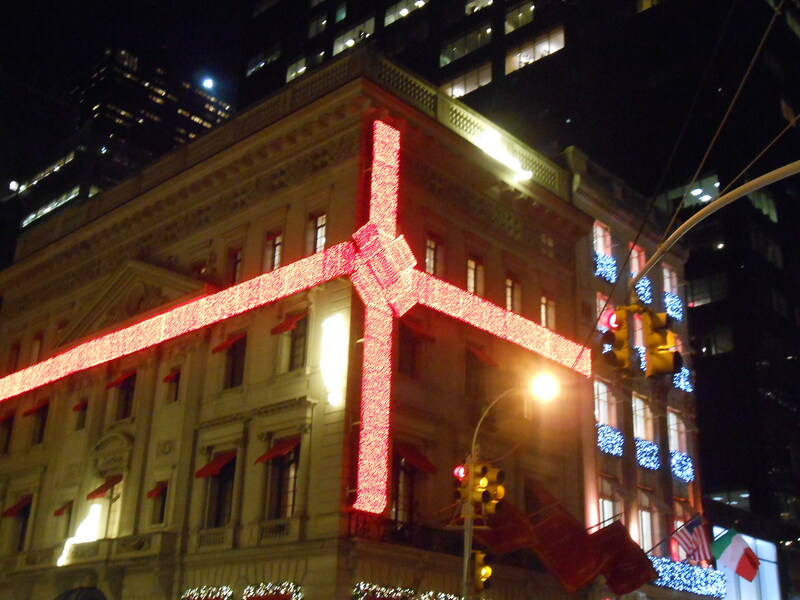 We stopped by a couple of places, such as The Peninsula then came across the famous store front of Harry Winston and the building wrapped like a present. 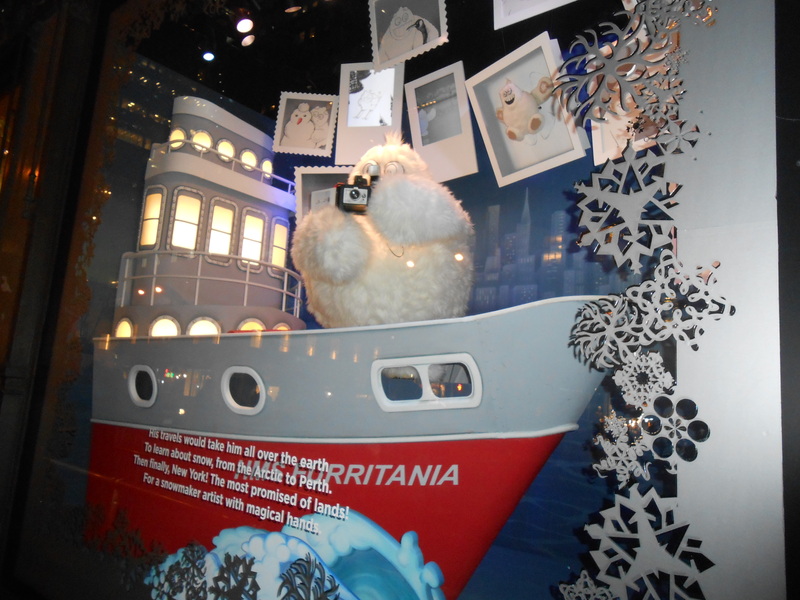 Then there was Saks Fifth Avenue window display that showcases the adorable and colorful story of Yeti, the abominable snowman and his journey from Siberia to NYC. 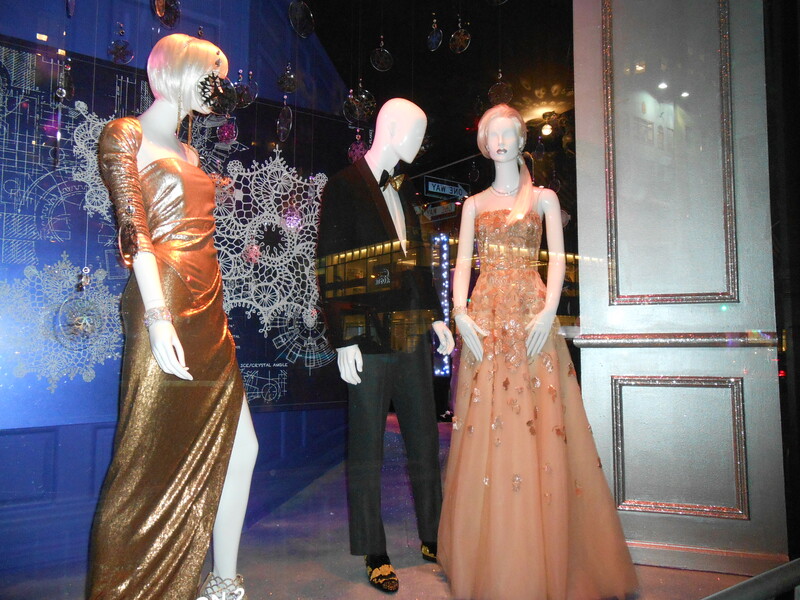 And then some beautiful fashionable displays of dresses and suits… I especially liked the rose gold gown with sparkling sequin-like flower detail cascading down the dress. 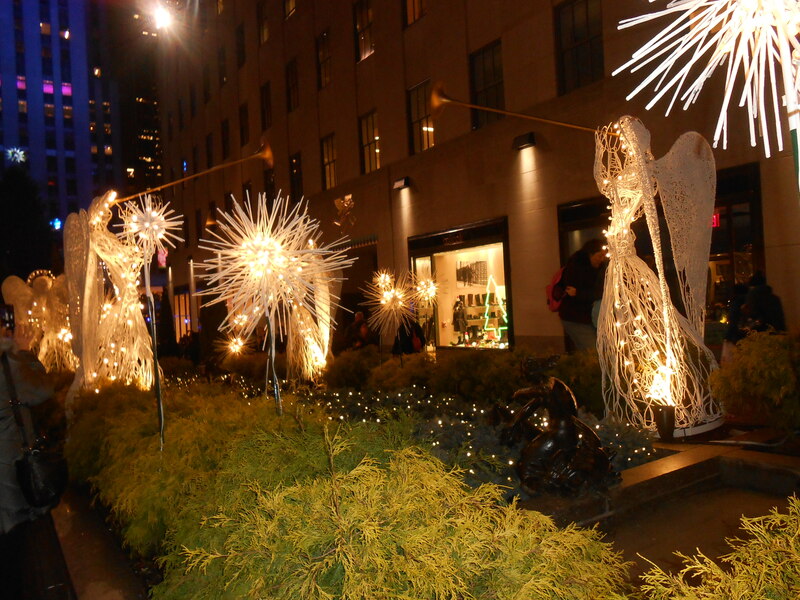 Next we came to Rockefeller Center and caught sight of the traditional display of lit up angels lining the walk toward the center. The tree wasn’t up yet, but it was still a sight to behold. 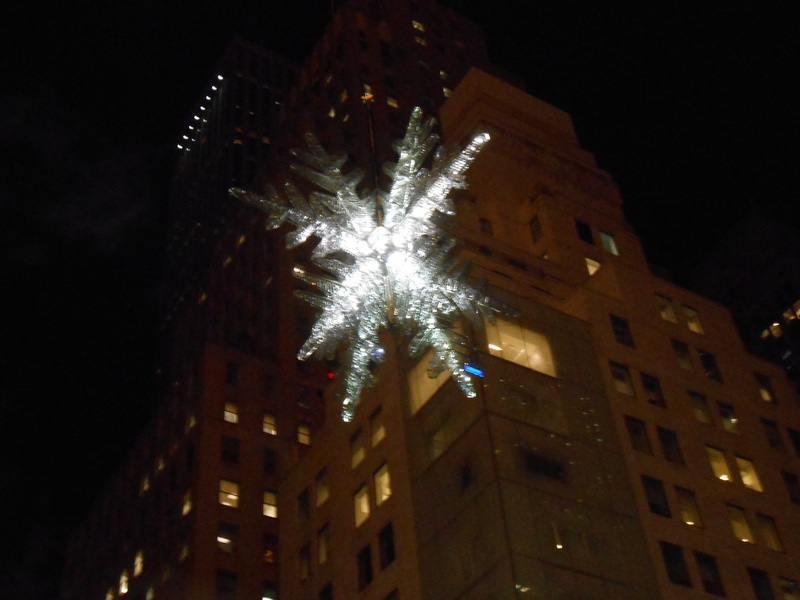 I also loved the glow of snowflakes against the building across from Rockefeller Center. 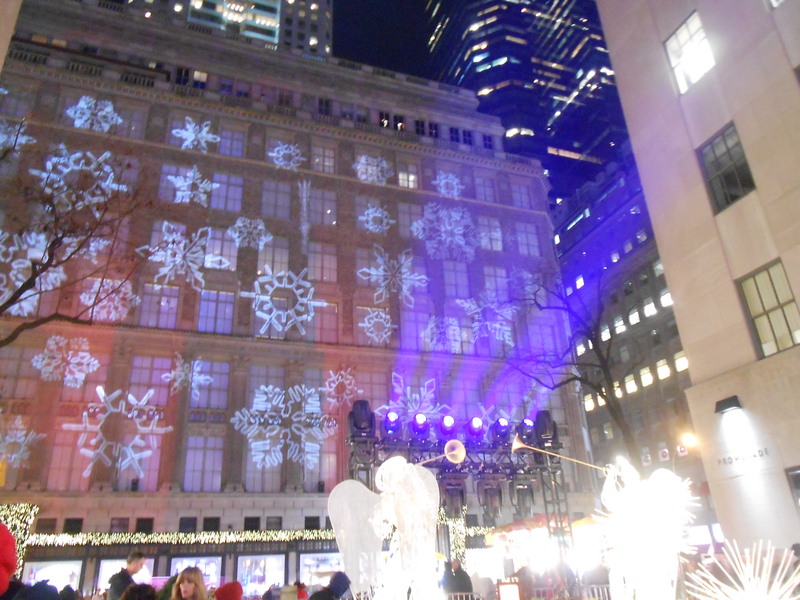 If you go before 6p, you’ll be able to witness the magical display of moving snowflakes, music and light. 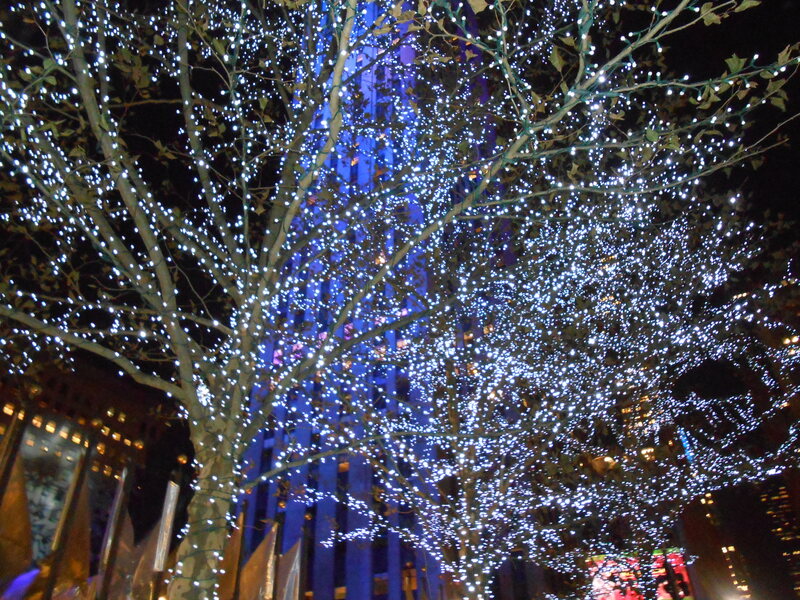 And of course the very pretty twinkling blue lights in the trees surrounding the Rockefeller Center area. 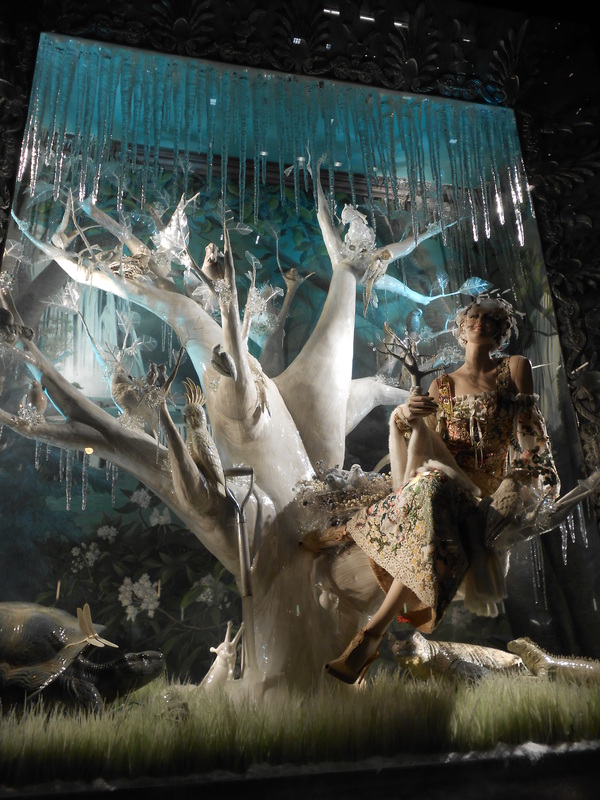 Other Must See Holiday Window Displays: Lord & Taylor and Macy’s. 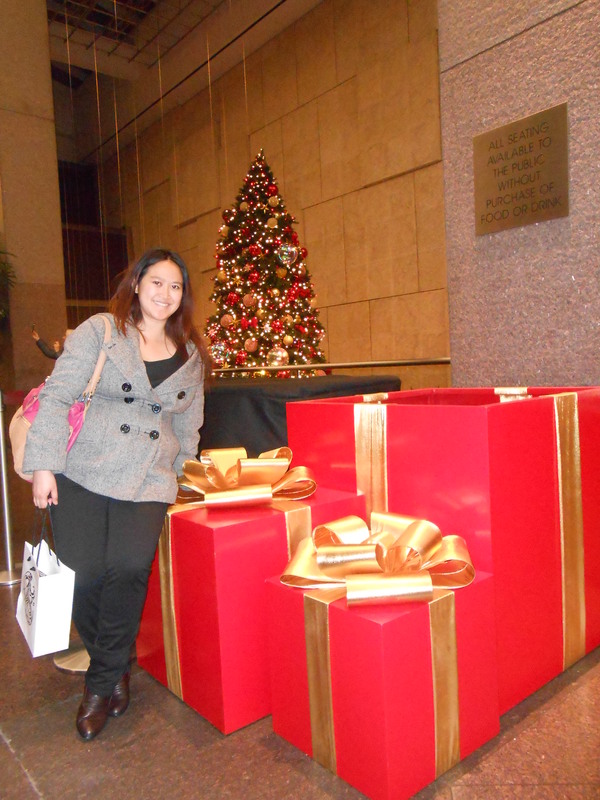 May you all have a beautiful holiday season, filled with family, friends, warmth and love!